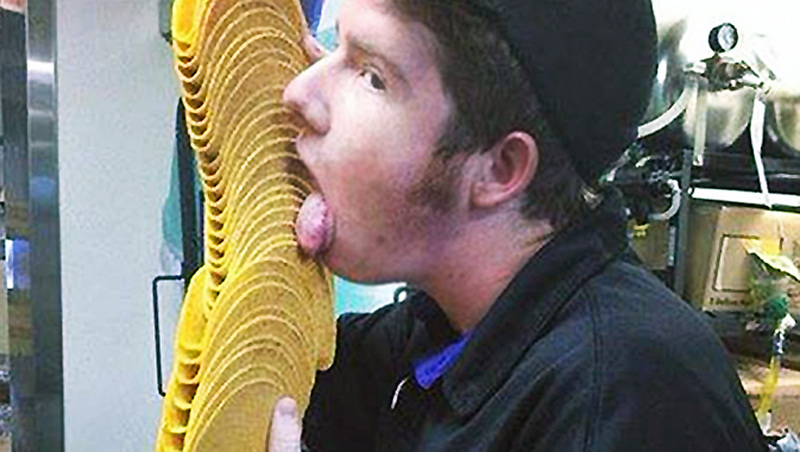 Taco Bell has fired the employee who caused a social media storm after appearing in an online photo licking a stack of taco shells, CBS Los Angeles reports. The picture, originally posted by user "Jj O'Brien Nolan" on the fast food chain's Facebook feed Sunday, was taken by the employee's co-worker at a Taco Bell in Ridgecrest. The co-worker was also terminated. Taco Bell said in a statement that the shells -- for Doritos Cool Ranch Tacos -- were used for training in March and were about to be thrown out, not served to customers. The picture was taken for an internal photo contest of employees taking the first bite out of the new product, but the franchise said the image was unacceptable and was never submitted. The photo "violated the rules and spirit of the contest, and the employees never submitted it," the statement said. "But an employee posted it on a personal social media page in violation of the franchisee's policies, and it emerged online in social media." The franchise said it is continuing its investigation into the matter and will implement any additional action it deems appropriate. "We do not believe these employees harmed, or intended to harm, anyone," Taco Bell said in the statement. "But we deplore the impressions this has caused to our customers, fans, franchisees, and team members. The behavior is unacceptable for people working in a restaurant."